Mobile phones are evil. There, I’ve said it. They present us with nothing more than an illusion. They make us feel as though we are more productive and can get things done quickly when the evidence shows they reduce our ability to be productive. 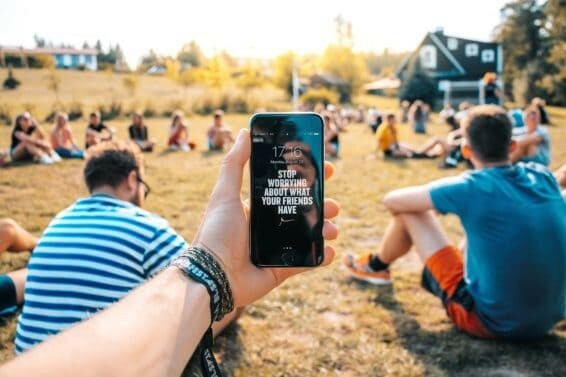 Mobiles make us think we are in touch with all our friends when in reality they present a snapshot of just a few people, often the ones we least want to be involved with. On top of this, that device in your hand is making you ill.
News research from Munich shows that the more you use your mobile phone, the lower your overall well-being. This study just adds to the growing amount of material from university researchers around the world connecting mobile phone usage with mental health issues. As we all use our mobile phones more and more we are becoming decreasingly satisfied with life. We compare ourselves with other people on social media, for instance, and assume they are all having a good time while we are alone, at home, eating a pot-noodle while watching soaps on the TV. Trash TV and a rubbish life to go with it are what we think. The fact that we can get instant messages in the palm of our hand, any time, any place anywhere, makes us think we are being productive. Instead of having to wait until the next day to deal with a message, for example, we can deal with it straight away. So, we send off a quick response, thinking we’ve achieved something. Except we haven’t. People who check their email on mobile phones tend to sort through it, answer one or two and then re-open emails on their desktop device later in the day or the next day. We are constantly opening and re-opening emails because we haven’t dealt with them. This is hugely inefficient. Can you imagine opening and then re-opening letters in the physical mail dozens of times before dealing with them? That’s what we are doing with email. The Bank of England published a study a year ago showing that the productivity stagnation in the UK economy was directly linked to the usage of mobile phones. It’s a magic trick. The mobile phone is making us think we are being productive because we can do something instantly. But in fact, all we are doing is delaying things, increasing repetitive work and reducing communication efficiency, leading to misunderstandings and misinterpretations which take more time to sort out. The fact that we get a sudden surge in happy brain chemicals when we get messages from friends means that our brains are fooled into believing that it’s all positive. Regular fixes of dopamine from seeing our friends on social media all contribute to making us feel good. Except for the fact that these neurotransmitter highs are quickly followed by lows. We realise that our friends are “having a better time” than us. Or we recognise the fact that they are actually aiming their message at someone else, rather than us. Our brain goes into a depressed state. But, hey, it doesn’t matter because along comes another “ping” from another message and with it another shot of those happy chemicals. This constant up-down emotional feeling means our brains recognise instability and it is this which is the issue. Subconsciously your brain realises that all is not good because often there’s some bad too. Stability is what makes for good mental health and well-being. The constant highs and lows generated by mobile phone usage are directly linked to brain activity making us feel worse about ourselves. The first thing to do is set a schedule for using the phone. Your brain loves routine. Set routines for looking at social media, or for dealing with emails. Stick to those routines, make them a habit. Secondly, make sure you switch off ALL notifications. These interrupt you, waste your time, and annoy you when you realise the alert was for something irrelevant. Alerts on mobile phones are reducing productivity and making you feel less in control, which increases stress. Thirdly, switch off your mobile phone two hours before you go to bed. Off; right off. Not on silent. And, certainly, don’t take it to the bedroom. Much or our mental health issues and lack of well-being are because we are sleeping with our phones. Well, actually we’re not sleeping – and that’s the problem. Mobile phones lead to significant amounts of sleep deprivation. Together these will help you get the most out of your mobile phone, with the least impact on your mental well-being. Social media is harmful to your children Social media is harmful to children. Numerous studies now point to emotional damage, particularly for younger children. Here's what you can do about it.